Note: Images and captions are a located at the end of this article. As a teenager working for a construction company, David King became interested in the many tools used to make labor easier. That interest led to a fascination with metal tools, their history, and their use in the blacksmith shop. He started collecting. "I looked up every flea market, auction, or sale anywhere within driving distance. I traded for some and bought others-anything a blacksmith may have used or presently uses," King said. "And my friends kept on the lookout." "My collection grew until it filled my garage and all other available space," he added. What started as a hobby became an obsession. "You would be surprised how many things you can find once you start looking," King said. The collection includes approximately 2,000 tools which the blacksmiths of yesteryear used to satisfy the requirements of an age of iron. 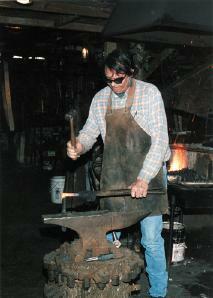 Many of the pieces were hand forged by the blacksmith who needed specialized implements. All King needed was a place to preserve and display his prize tools. He searched until he found the perfect spot for it, at 302 West College in historic Guthrie, Oklahoma. Two buildings make up the complex, one of which houses Southwestern Iron Works. Measuring the 65 by 100 feet, it was erected in 1905, two years before statehood, when Oklahoma Territory's capital was located in Guthrie. The larger building, measuring 100 by 150 feet and constructed of corrugated iron, preserves blacksmith tools and a machine shop. It was built in 1949 to replace one that had burned. This was still the day when steam-powered machinery was in full use. When the buildings were designed the foundry installed its own energy system and remnants of this system have been preserved, including overhead shafts from which belts ran to power the machines. Many of the implements which once served Southwest Iron Works remain, ready for display. In its early years the foundry turned out 30 tons of iron products a day. It included iron boiler stacks, farm tanks, the iron needs for local grist and flour mills, and iron stock for railroads. Southwestern Iron Works fell on hard times and in 1913 was sold at auction. It continued operations, but the name was changed to Guthrie Iron Works. However, with development of the Oklahoma oil boom, the owners concentrated efforts in 1919 to supply the metal needs of the developing industry. The firm became known as Oil Field Manufacturing. It continued to operate until the early 1980s. The oldest piece in the collection may date back to the 18th century. An enterprising smithy forged calipers of wrought iron to be used especially for blacksmiths. The measuring instruments with two legs can be adjusted to determine either inside or outside thicknesses of a piece of metal. The foot-long legs were carefully drawn, then filed to needle-point sharpness. The blacksmith expanded the legs until the tips measured the piece of iron, then placed the points against another piece with which he was working. In many cases, the needle-point legs can measure more accurately than a ruler. A trip hammer in King's collection bears the mold date of 1865. He happily demonstrates by heating a piece of metal to a glowing red, then placing it in the device and, with continued strokes by the machine, cuts through. It replaced hundreds of strokes made by the blacksmith's hammer. He has also collected eight drill presses: one is called a post drill press, so named because it was made to be mounted on a post. One prize piece is the hand bellows that preceded development of the blower. By back-and-forth movements of handles of the bellows, air is expanded and contracted to force air through a small opening and into the forge to keep the coals glowing. "Seldom will you find one so well preserved," King said. With development of the blower to feed air to the coals, blacksmiths no longer had a need for old instruments and tossed them aside. Stowed away and neglected, they deteriorated. "The owner of this one must have treated the leather often with neat's foot oil that preserved the leather, and must have kept it in a safe place. Even the varnish is still in good condition," he added. The tag on the bellows indicates it was a product of the Chicago Bellows Works. It measures five feet by three feet and boasts a double chamber, which produces a constant flow of air moving into the forge. The bellows were replaced by hand-powered blowers, which were equipped with a crank and enclosed blades that force a flow of air into the forge to keep the coals glowing. The U.S Cavalry horses and mules often needed hoof care while on missions away from the fort. That chore called for a portable blacksmith shop, complete with forge and anvil. The Champion Cavalry Shop measures 23 by 19 by 8 inches. The four support legs may be folded to conserve space when stored in a wagon that followed the horsemen. The label identifies the maker as Beaufort of Lancaster, Pennsylvania, and is dated 1880. The collection includes 20 forges of different designs and sizes, a dozen anvils and 17 blowers, one of which is screw driven. One of the anvils, probably produced to fit needs of the oil industry, weighs 350 pounds. Another anvil was apparently made especially for the establishment and was probably cast in the shop. As the mold was prepared to cast the anvil, the lettering was pressed into the side of the form bearing the firm name of Guthrie Iron Works. "I have approximately 300 hammers to serve any purpose," King said. Classification of hammers includes many devices, ranging from cutters, or blacksmith chisels, to the specialized tools designed to fit one specific use or possibly many uses. The blacksmith's chisel may be tapered and tempered to cut either hot or cold metal. It includes a handle which the smithy holds, and a helper lifts and lets fall a sledge hammer on its flat top. The sharp bottom of the chisel cuts into the metal held between the cutter's sharp end and the anvil. King has collected about 200 pairs of tongs designed to fit any piece, whether it be flat, a circle or corner. All were hand made by the blacksmith. His collection contains 10 drill presses, a disc sharpener, barbed wire, nuts and bolts and the dies that cut the threads. It also includes a supply of fence tools, 20 cycle grinders and a supply of hand-made wrenches produced at the turn of the 20th century. There is also a set of riveters and five swages, which is an anvil-like implement into which a heated piece is placed and pounded to conform to any shape. King has also found a machine used in the early days to generate power for acetylene welding. He said carbide was dropped into water to develop the power. "It was a dangerous procedure, as explosions sometimes occurred during the operation," he explained. Of course, one of the major enterprises of the blacksmith was to keep the farm wagons in running condition. 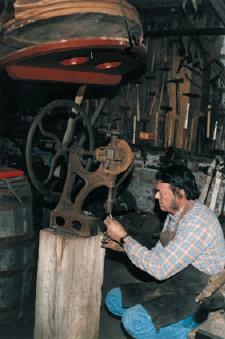 Wheels often needed repair and the blacksmith had to know how to work with a combination of wood and metals. With time, as the wood inside the metal rims shrank, the wheel might become loose, the rim would drop off, and the wheel would fall apart. To remedy the threat, farmers sometimes soaked wheels in the stock tanks or in a stream to swell the wood. The job put the wagon out of use for awhile and served only a temporary purpose. Eventually the problem had to be remedied. That meant shrinking the metal rim. It was removed from the wheel and placed in a shrinker which was fitted with sharp teeth that dug into the inside circumference of the metal rim. Two sets pushed together, lessening the distance between them, thereby closing the rim circumference. When wooden wheels were taken apart for repair, they had to be refitted. The wood outside measurements were planed or sanded down to conform to a circumference a little larger than the metal rim. To replace the metal, the blacksmith heated it to a cherry red or until the expansion from heat permitted the covering rim to slip over the wood surface. With cooling, the metal shrank to hold the wheel tight. The collection of tools includes "travelers"-a wheel which measured the outside circle of the wood and the inside circumference of the metal rim. Along with the repair of wagons and buggies, the blacksmith was equipped and trained to fulfill the requests for shoeing and hoof care of horses and mules. When the control of horses meant a special bit, the blacksmith was called upon to hammer out, bend and weld to fit the horse's mouth. The collection includes 20 such hand-forged bits. The modern blacksmiths find plenty of scrap metal with which to work and often have no reason to search for a supplier. Coal, however, must be of the highest quality, and the smithy must find such a trusted dealer. Loading, unloading and moving the heavy equipment about poses no problem, because overhead crane tracks were installed when the buildings were constructed. And they have been put to good use. King and Southwest Iron Works served as host to four of the meetings of the Saltfork Craftsmen Annual Blacksmith Conference and they are again making plans to hold a meeting at the museum in October, 2001. At each monthly meeting of the Saltfork Craftsmen's Group, members receive an assignment to bring to their next meeting a recent artistic creation. Projects range from angels and flowers to boot scrapers. Assignments are designed to challenge creative craftsmanship. The Saltfork group, affiliated with the Artists-Blacksmith Association of North America (ABANA), lists 113 members and spouses. Members hail from Oklahoma, Kansas, Texas and Arkansas, and there is even a member from Indiana and another from Illinois. To meet the demands for iron tools during Oklahoma's oil boom years, the foundry changed its emphasis to production. Pieces of machinery that had been installed to fit those needs were dispersed. King was able to trace practically every piece to the new owners, bought them, and returned them to their former home. That machinery includes eight lathes. They range from three feet to 20 feet. He was also able to find and buy a small pedal-powered lathe, a real antique. It, too, is a part of the facility that preserves implements of the past. In his avid search for tools of the trade, King also sought books on the history and the finer practices of blacksmithing and will display his library of more than 1,000 books as a part of the museum. The collection has preserved for posterity the legacy of tools that once served an entirely different way of life. David King, owner of Southwestern Iron Works Museum of Blacksmiths in Guthrie, Oklahoma, keeps in practice by heating and cutting a metal rod. Devoted to preserving for future generations the tools of blacksmiths, the museum's collection of tools and other blacksmith-related items is extensive. David King checks out one of the drill presses he displays in Southwest Iron Works Museum.